Hello and welcome to Standard Sport's live coverage from Stamford Bridge. The Blues, 17th in the Premier League, will relish the opportunity to leap to the top of the table tonight, albeit in their Champions League group. We'll have team news from Stamford Bridge shortly, but first stand by for some pre-match reading to whet your appetite. 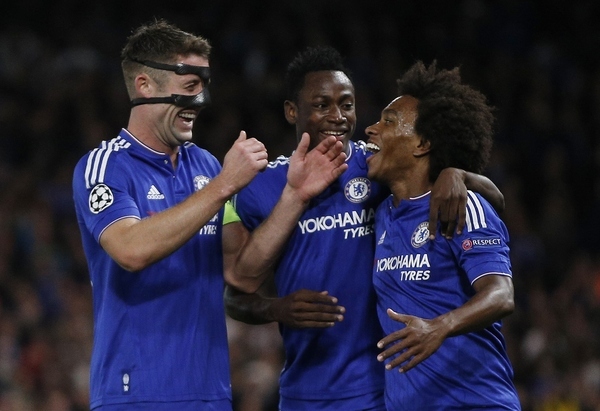 Tonight is a chance to get away from the doom and gloom of Chelsea's domestic start. So, Jose Mourinho has made six changes to the side which lost at Everton on Saturday. 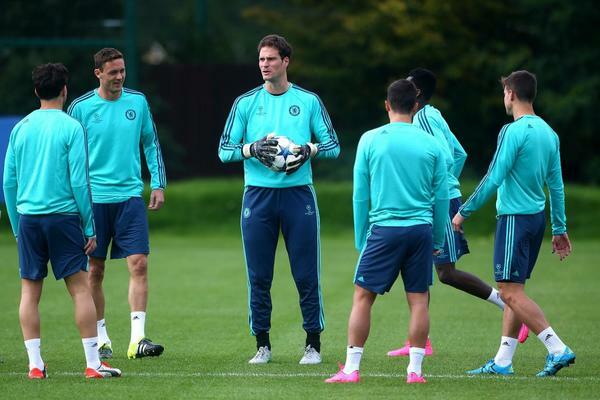 John Terry, Branislav Ivanovic and Nemanja Matic among those to drop out. 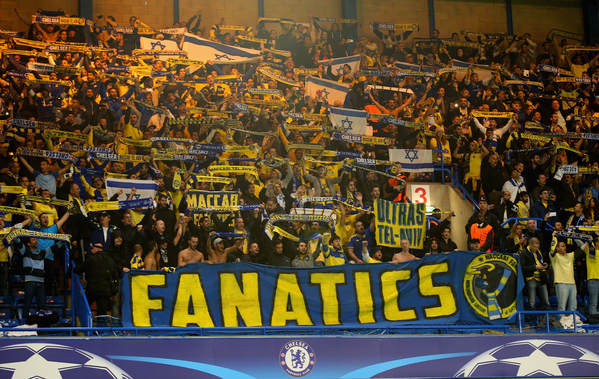 The Maccabi fans are in joyous spirits here at the Bridge - they are currently singing their hearts out in the away end. [The Champions League] comes in a good moment for us, because I think it is important for us not to be influenced by our bad results in the Premier League. Meanwhile, we've just spotted Radamel Falcao walking around the press room. He's out of the starting lineup with a minor strain with Loic Remy making his first start since the Community Shield today. Other than that, Mourinho has removed vice captain Branislav Ivanovic from the team, probably with one eye on the Arsenal game. It'll be interesting to see how Azpilicueta does at right back while Abdul Baba Rahman gets his chance to impress at left back. And, of course, Loftus-Cheek replaces Matic in the defensive midfield position. It's the 19-year-old's first start for the club this season. There are still a lot of empty home seats here at the Bridge. Mind you, the weather has been awful today but the rain has finally cleared up. So let's look at the match now... 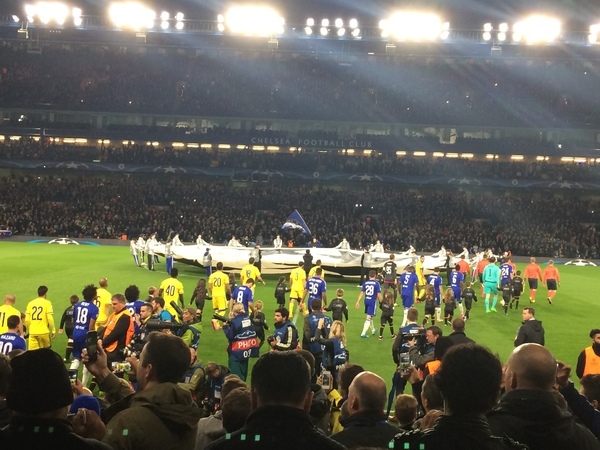 This is the first time Chelsea and Maccabi will play each other in a competitive fixture. The Israeli club come into this Group G game with confidence as they are unbeaten in seven games in all competitions. Maccabi coach, Slavisa Jokanovic, played for Chelsea and previously used to partner John Terry in central defence. But he is fully focused on Maccabi now and admitted earlier this week he wanted to inflict more pain on the Blues following their awful start to the Premier League season. I did warn you they were in full voice. Will Macccabi become the third side to take something from Stamford Bridge this season? 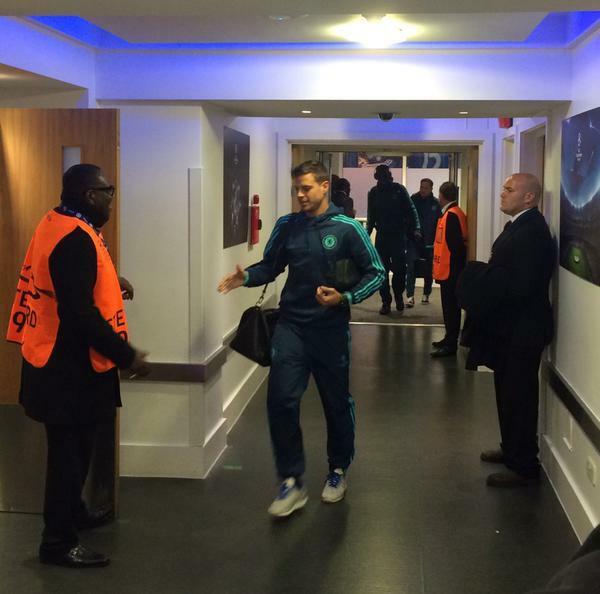 The Chelsea players have just come off the pitch after warming up. 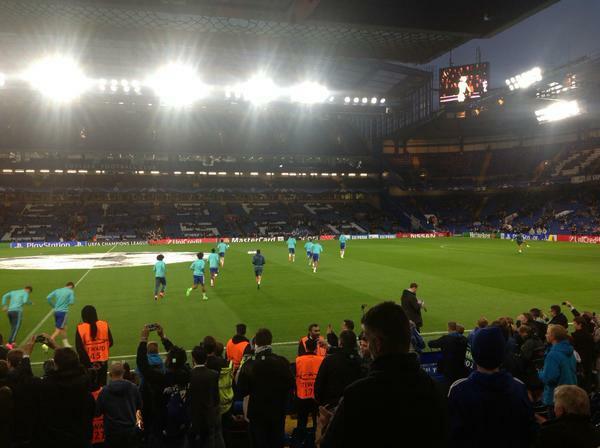 We are just 15 minutes away from Chelsea's Champions League opener! So Chelsea have lost three of their first five matches so far while Maccabi beat Hibernians, Viktoria Plzen and Basel to reach the group stages of the Champions League for the first time in a decade - and for only the second time ever. Impressive. 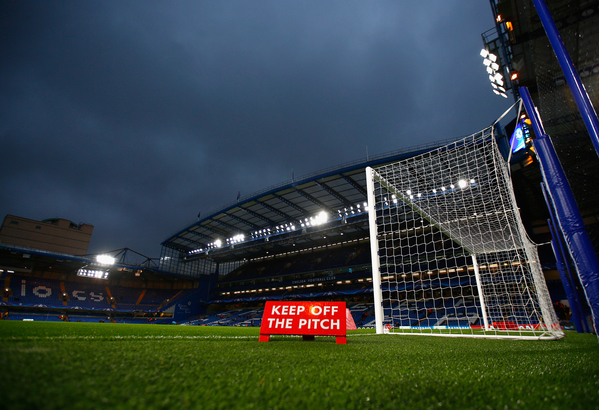 An expectant Stamford Bridge ahead of kick-off. A 'fresh start' as manager Jose Mourinho puts it. 2mins: Remy latches onto the ball, gets past Tibi but he's offside. 4mins: Penalty to Chelsea! Remy is fouled in the area by goalkeeper Rajkovic as he made a fine run into the box - but Hazard has just fired the resulting spot kick way high of the bar! Wow, what a chance to miss! That penalty perhaps shows just how much pressure Hazard is under to be the man to start turning Chelsea's result around. By the way, Rajkovic got a yellow card for his initial foul on Remy - although the home fans were urging the referee to show him a red. 9 mins: Oscar wins a free kick just outside the box after Ben Haim I - formerly of Chelsea - fouled the Brazilian. Oscar takes the set piece but it goes straight into the wall. 11 mins: Azpilicueta superbly wins the ball from a misplaced pass and drives it to Remy on the right flank before the striker fires a shot towards the near post that Rajkovic saves. 14 mins: GOAL! And Chelsea have scored! The Blues were awarded a free kick for Shpungin's foul on Hazard, which Willian took and curled past the wall and into the far corner of the net. 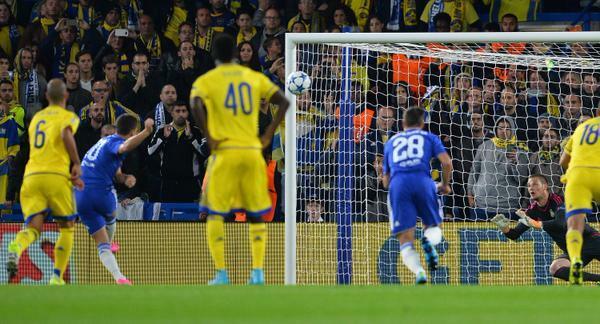 Chelsea 1-0 Maccabi. 17 mins: Willian receives some medical attention on the pitch but is back up and fine now. 20mins: Chelsea are looking much more confident since taking the lead,but goalscorer Willian has come off with an injury and has been replaced by Diego Costa. Remy moves over to the right to allow Costa to lead the attack up front. 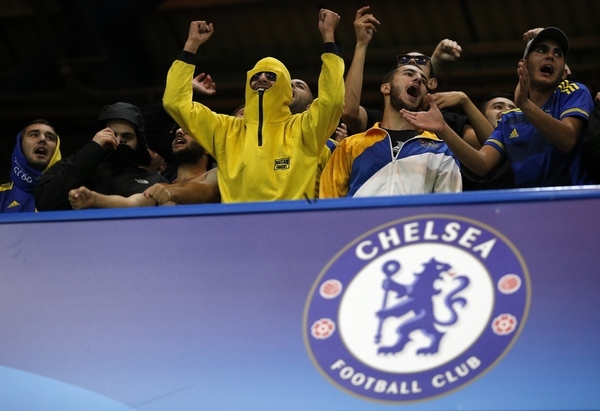 26mins: Maccabi may be losing but it's not preventing their fans from remaining optimistic - they haven't stopped singing since Willian scored! 28mins: Hazard is fouled which leads to Chelsea being given a free kick. Baba Rahman takes it - but blazes well wide of the goal. Still, he's looked good on his debut tonight. 29mins: And as I type that, the left back gives away a free kick to Maccabi. It's whipped into the area but it's headed just over the bar by Zahavi. Close. 34mins: So after a bit of pressure from the visitors, Chelsea go back on the attack and Fabregas' corner forces Rajkovic into a save. Still 1-0 to the Blues. 36mins: Remy is appealing for a free kick after seemingly being fouled just outside the area. He doesn't get it but Chelsea have put the ball into the back of the net - although it's been given as offside. After Fabregas worked the ball into the area, Costa attempted an overhead kick which rebounded off a Maccabi defender and into the path of Oscar. The Brazilian poked in from close range but it's not been given. So it seems Oscar's strike wasn't given because of dangerous play from Costa as he performed his overhead kick. 42mins: Hazard rolls the ball into the path of Loftus-Cheek and as the midfielder tries to push forwards, he goes down from a touch by Rajkovic. Nothing is given though although replays showed the goalkeeper did make contact with Loftus-Cheek. Two minutes of added time here in the first half.